We never charge for over time for weekend services or holidays. The goods and services shown below are those we can provide to our families. You may choose only the items you desire. 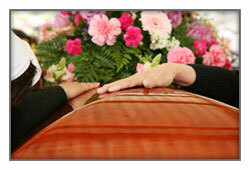 However, any funeral arrangement you select will include a charge for our basic services and overhead. If legal or other requirements mean you must buy any item or service you did not specifically ask for, we will explain the reason in writing on the statement we provide describing the funeral goods and services you selected. Except in certain special cases, embalming is not required by law. Embalming may be necessary, however, if you select certain funeral arrangements, such as a funeral with viewing or you are to be placed in the tomb for the winter after the cemetery closes for the winter. If you do not want embalming, you usually have the right to choose an arrangement that does not require you to pay for it, such as direct cremation or immediate burial. This will be added to any service that must be probated thru the court. and services of Funeral Director and staff for a minimum of 4 hours. Each additional hour over 4 hrs is $150.00. and services of Funeral Director and staff for 2 hours. Each additional hour is $150.00. This includes coordinating the funeral ceremony in our facility. This includes coordinating the memorial service in our facility. $455.00 This includes our Funeral Director and staff for theGraveside /Committal service at the cemetery of your choice. at the church of your choice. and obtaining of necessary permits. period of time before final disposition. This includes the removal, embalming, filing of all necessary paperwork and necessary authorizations, and local transportation to the Boston airport. This includes temporary shelter of the remains, transportation from the Boston Airport and transportation to the local cemetery and necessary services of the Funeral Director and staff. This does not include necessary cash advances, e.g. cemetery fees, Clergy or Vaults. This includes temporary shelter of the cremains, Transportation to the local cemetery and necessary services of the Funeral Director and staff. This does not include necessary cash advances, e.g. cemetery fees, Clergy or Vaults. This includes arrangement of a Memorial Service at a Church or other facility and/or for the interment of cremated remains at a cemetery or mausoleum of your choice. This fee does not include the presence of Funeral Director and staff at the service or burial. This includes removal, care and temporary shelter, Refrigeration and necessary authorizations, necessary services of the Funeral Director and staff, and local transportation to the cemetery. This does not include any rites or ceremonies or cash advances, e.g. cemetery fees. *This does not include the cost of the casket. 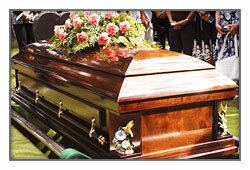 Vaults are required in most cemeteries and are not included in this cost. Our charge for a direct cremation without any attendant rite or ceremony includes removal, care and temporary shelter, necessary services of the Funeral Director and staff, refrigeration, authorizations, transportation to the crematory, and cremation fee. If you want to arrange a direct cremation, you can use an alternative container. Alternative containers encase the body and can be made out of materials like fiberboard or composite materials (with or without an outside covering). The containers we provide are listed here. Our charges for international shipping includes removal, embalming, dressing, casketing, 20 gauge metal casket, shipping container TSA inspection all documents, permits and transportation to the Airport. Does not include flight. This includes the register book and cards.